Ht. : 6’3” Wt. : 182 lbs. NHL Draft Eligibility: Prospect is eligible for 2017 NHL Entry Draft. 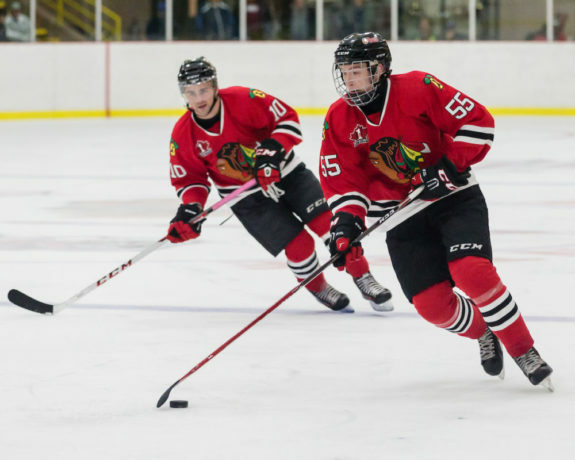 Named the 2016-17 CCHL Top Prospect, Brockville Braves’ Cameron Crotty has a chance to become the highest drafted player to come straight out of the CCHL. Even if the Boston University-bound defenseman is not selected in the opening two rounds of the 2017 NHL Draft, he’s certainly been one of the league’s most scouted players in years. In December 2016, he received a B-rating from Central Scouting, indicating his high-level status. Invited to participate at the recent NHL Combine in Buffalo, Crotty was one of 104 prospects to test their skills before front-office personnel and scouts. He proved to be a top-25 talent in four of the combine’s 14 tests. He credits his elite skating technique, in part, to taking figure skating lessons when he was 3 years old. Recovering from an early-season injury, Crotty appeared in 41 games with the Braves, scoring four goals among 13 points and 32 penalty minutes. As a rookie in 2015-16, he appeared 57 games with three goals, 15 assists and 38 PIMs. NHL scouts are enamored with his size and athleticism. Recognized as an all-around defenseman, Crotty has the strength to ward off forwards battling for position in front of the net and the speed to pace a breakout. Teammates credit Crotty for helping create scoring opportunities with crisp, precise passes and clearing the defensive zone with outlet connections. A right-shot defenseman, Crotty is expected to be picked among the first 125 selections of the upcoming draft. Some insiders predict he’ll go as high as the second round. If he happens to fall a few rounds, a franchise likely would see Crotty as an way to bolster its defense corps with a “value” middle-round selection. Crotty has size, hockey IQ and a unique skating ability for a defender of his size. NHL scouts scour the world for those three traits. Roster spots for big, tough, mobile defenders are plentiful and NHL insiders expect Crotty to develop into a top-4 blueliner. Crotty competed with Canada East in the 2016 World Junior A Challenge and was named to the 2015-16 CCHL All-Rookie Team.